Could something like this be in our future? A new paper being published tomorrow in the Journal of California Geophysics by Pompilius Eostur-Monath and Numa Huhtikuu includes some eyebrow-raising findings concerning the origin of California's Central Valley and Coast Ranges. 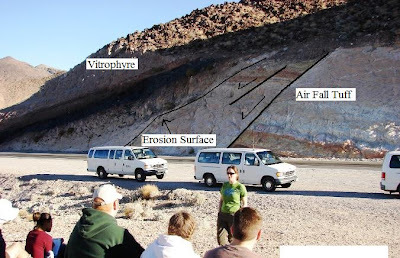 They relate their findings to the rapid uplift of the adjacent Sierra Nevada in the last few tens of millions of years and their apparent lack of mountain roots that has caused consternation and confusion among researchers for years. The last decade or so has seen the rise of the "mantle drip" hypothesis in which the once-present roots detached from the base of the crust, and sank into the mantle. The Sierra then rose as hot mantle material surged into the gap created by the sinking mass. What has been less clear has been the position and role of the Central Valley in the process. Paleomagnetic data from deep bore holes in the deepest parts of the valley between Bakersfield and Modesto indicate that the sediments of the Central Valley accumulated 40 miles east of their present location, and that they moved as a coherent unit with very little internal deformation. In essense, they are the upper plate of a huge detachment system. Although they didn't come right out and say it, the researchers suspect that the movement may have been nearly catastrophic in scale, similar say, to the giant landslides that have originated on the Hawaiian Islands that are implicated in giant Pacific Ocean tsunamis. In a personal communication, one of the researchers suggested to me that the movement may have resulted from a single huge seismic event, possibly in the range of a moment magnitude of 10 or 10.5 (normally faults can't store this kind of stress, but the unusual nature of the contact zone and the four-hundred-mile length allows for much higher levels of energy release). In other words, the sediments of the Central Valley didn't originate from erosion of the Sierra Nevada...they were deposited on top of the Sierra, and later catastrophically slid off! And here's the most unlikely part of the story: why didn't the Central Valley sediments continue westward, sliding off the continental margin into the Pacific, causing an ocean-wide mega-tsunami? 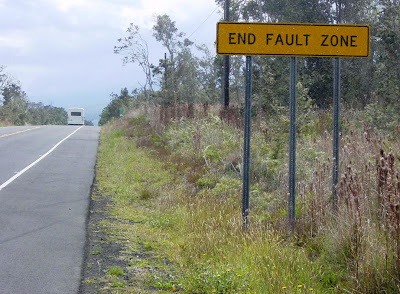 Believe it or not, the San Andreas fault! Because of the shifting the granitic terrane of the Salinian Block north nearly 200 miles, a ridge of solid rock stood in the path of the shifting mass, blocking its westward movement, and crumpling the sediments of the valley floor into the the folded sediments of the eastern Coast Ranges! So, in one stunning paper, the researchers have explained the origin of the Sierra Nevada, the Central Valley and the Coast Ranges. They do caution that the events they describe are so unlikely that they have no fears that there will be a repeat of this activity in the event of a large earthquake on the San Andreas fault. I could have had an MBA and a corner office! Geology as a profession gets mentioned on National Public Radio! You can get $80,000 a year to start, with a four-year degree! Mining companies and Petroleum companies are fighting over newly-minted graduates, with some people receiving multiple offers! Hear it all here: http://www.npr.org/templates/story/story.php?storyId=88772878. But...I wonder if this is a very useful thing to have happen in our profession? I maybe have a unique point of view, in that I got into geology as a profession out of a love of all things earth-related, and it makes me wonder whether that is the case for all the other geologists out there? Maybe the geoblogosphere is the wrong place to ask, because running a blog on geological topics suggests a love of things geological as well. But there are a lot of students out here. Are your friends and colleagues in geology for love or money? 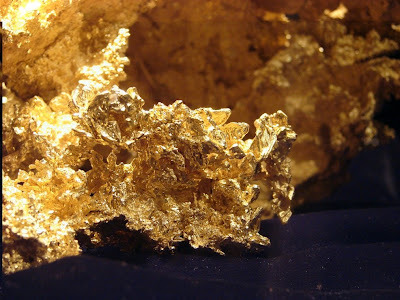 Does anyone break into this field, facing four years and more of calculus, chemistry and physics, as well as years of hydrology, structural geology, mineralogy, geochemistry, micropaleontology, just to pick up $80,000 to start? I see a lot of people who go into real estate, banking, accounting and the like and they make good money, but they don't generally like what they do, and build their lives around the weekends and times away from the job. That's not generally the case with the geologists and teachers that I know. They live for weekend field trips so they can get out and see even more geology! So, are we ready for a flood of students whose motivation is primarily financial? Or will they even make it past the first hurdle of chemistry 101? Geology tends to be a boom and bust economical field; will a flood of graduates saturate the field just in time for the next economic bust? What do you think? I often ask my students how we can be so sure that the laws of the universe apply to the distant past when "no one was there to see it" (a common creationist argument). I ask what tool we would need to confirm these things. Eventually someone says, derisively, that it would require a time machine. I ask if we have such a thing, and after all of the negative answers I argue that a telescope is indeed a time machine. Everything we see now in the cosmos happened in the past. 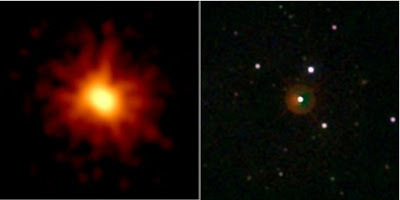 And all that we see in the cosmos shows that gravity is operating to hold stars and galaxies together, and that electromagnetic energy was present in the most distant objects in the most distant times. And yet we have short-sighted decisions made by bureaucrats. From the Associated Press we get this: NASA Cut Means No Roving for Mars Rover. NASA has a way of cutting the most exciting and interesting programs (Hubble Telescope, e.g.) that have had the most profound effect on our view of the universe. The Mars Rovers have been one of the most successful adventures on another planet...designed for a 3 month mission, they have lasted for four years, and continue to transmit valuable data that are changing our view of the origin of the Solar System, and the past history of Mars. It is a poor decision; they should be fighting for these programs, not cutting them. More information on the Mars Exploration Rover Mission can be found at http://marsrovers.jpl.nasa.gov/home/. The 4 million dollars they intend to cut represents 16 minutes of Iraq war funding, if the numbers I heard are right. OK, that didn't take long, and having seen what Silver Fox, Kim, and Ron Schott are capable of, I am not surprised. Congratulations! Also, I'm glad you all answered quickly, because here is the picture I really wanted to post in the first place. I don't know a great deal about Kansas, but I am jealous of Kim's outpost in the Rocky Mountains (having visited the region quite a few times), and I really miss central and eastern Nevada (Silver Fox's domain) from my days at the University of Nevada, Reno. But I do live near a lot of wonderful geology; the Sierra Nevada foothills are rich with metamorphic terranes, batholithic intrusions, volcanic rocks, and overlying sedimentary sequences. The previous post is a ground level view of the Stanislaus Table Mountain, a striking example of an inverted stream. The latite eruption (I believe this is the type locality for latite) emanated from vents near the crest of the Sierra Nevada at Sonora Pass and the Dardanelles, and flowed more than 40 miles through rolling hills and wide, relatively shallow valleys. The flow dates to around 9 or 10 million years ago. 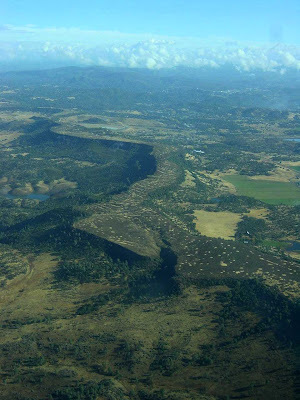 Increased river gradients caused by the uplift of the Sierra Nevada led to the erosion of the softer rocks around the lava flow, causing the former stream bottom to stand out as a ridge. I had the opportunity to fly over the mountain a few years ago, and the view from above is striking. I have a more extensive collection of photos from my flight at http://geotripperimages.com/Links_We_Like/Stanislaus_Table_Mtn.htm. I RESIDE at Table Mountain, and my name is Truthful James;I am not up to small deceit or any sinful games;And I 'll tell in simple language what I know about the rowThat broke up our Society upon the Stanislow. For any scientific gent to whale his fellowman,And, if a member don't agree with his peculiar whim,To lay for that same member for to "put a head" on him. Till Brown of Calaveras brought a lot of fossil bonesThat he found within a tunnel near the tenement of Jones. And on several occasions he had cleaned out the town. Spent a third straight weekend with students and fellow geologists in the field. I was pleased with the telephoto that allowed me to get an angle on a relatively inaccessible outcrop. I know I could just explain it, but so many of you seem to enjoy the challenge, so...what's going on here? Happy Easter, and a good spring-time to you all! Update: Ron is absolutely right about the columnar jointing. What kind of volcanic rock, and why is the rock forming a flat-topped ridge? 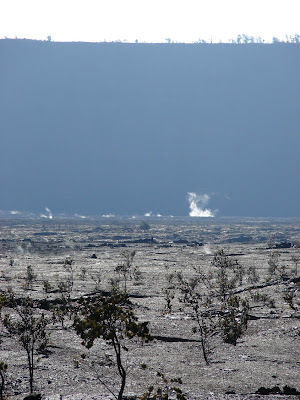 Following up on notes from Ron Schott (Kilauea Summit Activity) and an amusing headline juxtaposition noticed by Andrew Alden (Headline Funny), the news of the day is activity in the main summit caldera of Kilauea, Halema`uma`u. An explosion in the wall tossed chunks of old lava up to a cubic meter over an area of about 75 acres (sorry for mixing measurement methods), damaging some of the parking areas and trails near the caldera rim. I am often fascinated by the intrinsic connection between earth events and regional religious beliefs. The native Hawaiians had an excellent understanding of the basic geological relationships of the islands in their stories of Pele's search for a home in the isolated islands in the middle of the Pacific. In a similar way, the legends of native Americans in southern Oregon explained the formation of Crater Lake more accurately than some early geological interpretations. I love the Hawaiian islands, and visit them whenever I can. I am an unusual tourist I suppose, avoiding Waikiki and Honolulu as much as possible, and spending as much time as possible in the island interiors rather than the beach. A story I once assumed was very simple (shield; hot spot, lava) has become delightfully complex: shield evolution, new hot spot interpretations, giant mega-tsunamis and landslides, evolutionary mysteries with the honey creepers, ravens, hawks, owls, and nene, the Hawaiian goose, and incredible diversity of landscapes from tropical rainforests to alpine barrens. And, there is nothing in the world quite like standing next to flowing basalt. 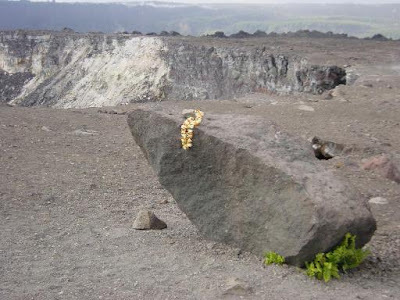 Many Hawaiians take the story of Pele very seriously, and there is almost always an offering left on the crater rim of Halema`uma`u. I have enjoyed Pele's beautiful gifts, and intend to leave an offering of my own next time I get the chance to stand at the edge of her home on the Big Island. 1) Tremors (1990): Finn Carter as seismology student Rhonda LeBeck. Speaking from an entirely gender-biased point of view, Finn wins my vote as the finest portrayal of a geologist in a Hollywood movie. Intelligent and creative, and cute, too. And finding strange underground worm things using a seismometer. Rachel didn't get much credit for being the first Hollywood geologist to get sucked into a volcano, but she displayed many of the traits of the real geologist: self-effacing, nervous in front of cameras, and yet a good and perceptive researcher. Of course, she wasn't a leading character. The actual 'star' of the film, Anne Heche gets honorable mention for looking at a topographic map on-screen, but then using a basketball to confirm that a street does in fact slope downhill the wrong way. James Bond as volcanologist?? Well, I dunno...too clean-cut, too shaven, too cultured. Now, the rest of his team, though, they were more like the people I see and work with on a regular basis. Coffee addicts, intense, and lovers of volcanoes. Some of the portrayals of geological processes were done pretty well, except for that really fast-moving Hollywood lava, and driving a truck through said flow without dying from the radiant heat. And that acid lake that killed grandma. And that overly steep giant Hollywood volcano in Idaho. I really liked the bridge that got washed out at the end of the movie, though. In his pre-"Deep Space Nine" days, Rene played a geologist who thought that the mysterious uncharted island was hiding a lot of oil. When shown to be wrong, he did what many geologists are known to do...he got drunk. The second or third line of the movie had Julia Roberts saying "I love geology". I melted on the spot and was hers from that point on. Though she was actually a legal clerk and not a geologist, she was shown researching groundwater chemistry, taking samples of poisoned water, pulling dead rotting animals from wells, and running away from security guards after trespassing on company property. All in a day's work for any field geologist, I should think. O.K., so he was really an archaeologist, but he dug in the earth a lot, and the character was in fact based on Roy Chapman Andrews, an adventuring paleontologist who explored the Mongolian deserts in search of ancient life in the 1920's. His expeditions found the now renowned Flaming Cliffs which contained fossils of protoceratops, oviraptor, and that most famous of movie dinosaurs, velociraptor. His party also discovered the nests of some dinosaurs, containing egg clutches in concentric circles, and some very rare Cretaceous mammals. They were chased by bandits and assaulted by horrible dust storms. And what geologist doesn't dream of dramatic adventures in the field? 7) Jurassic Park (1993) and Jurassic Park III (2001): Sam Neill as Dr.Alan Grant. His character was ok, but I was most impressed by the office trailer for the paleontology dig in Montana; messy, dusty, newspaper clippings on the wall, lunch mixed with research; a true geology office! The third movie in the series mostly had people getting eaten, but as usual, the dinosaurs looked pretty cool. I don't really remember much about the geologists, but I loved the "element" they used to drill into the mantle and core in only two or three days; it was called "Unobtainium". And that giant mantle amethyst geode was pretty cool, even if the crystals killed some of the crew members. 10) Bringing Up Baby (1938): Cary Grant as Dr. David Huxley. Handsome guy, looking for a dinosaur bone with beautiful Katherine Hepburn at her best, a pesky dog and a pair of leopards. What more could you ask? 11) Eight Below (2006): Bruce Greenwood as Dr. David McClaren. Off on another trip this weekend, to the Spring Conference of the National Association of Geoscience Teachers, Far Western Section, hosted this year by Palomar College and CSU San Marcos. We will be participating in a number of field trip choices along the southern California coast, and up in the Peninsular Ranges. 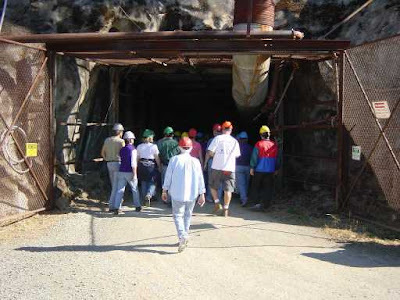 The highlight for me will be a tour of a working tourmaline mine in the Pala area. Tourmaline is a beautiful complex silicate gemstone. The highly variable composition results in a rainbow of colors, sometimes in a single stone. One of the more famous is the "watermelon" stone that is green on the outside and bright pink on the inside. 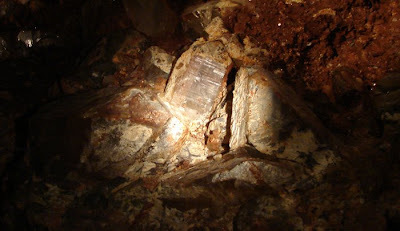 It often occurs in trigonal prismatic crystals. The tourmaline occurs in pegmatite veins associated with batholithic rocks of the Peninsular Ranges. During the early part of the last century, the stone was highly desired in China, although demand dropped off later on in the 1920's. Some of the gemstones are nothing short of spectacular, weighing several pounds, and reaching a foot in length. The National Association of Geoscience Teachers is a great organization to meet with other geology teachers, and to see some really wonderful parts of the western United States. During NAGT conferences I have had the opportunity to walk around the deepest parts of open-pit gold mines, explore active lava flows, search for fossil fish in old lake beds, and to visit some of the most beautiful places I can imagine. 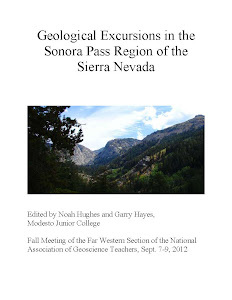 We are always looking to add new members...the Far West Section, covering California, Nevada, and Hawaii has two conferences every year, and offers an extensive collection of geological road guides from past conferences. Our Fall 2008 will be hosted by CSU Chico, and will have trips exploring the northern Coast Ranges and the Lassen Peak region. Other sections around the country have similar programs available. The national NAGT publishes the Journal of Geoscience Education, and has extensive web resources available. 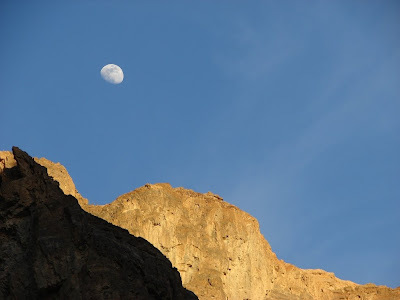 Dave Schumaker, and the Geology News blog (http://geology.rockbandit.net/) is back after a long absence, and I am looking forward to his insights on the geoblogosphere. He caught a post from the National Research Council and National Academies on the Ten Questions Shaping Earth Science Identified. This isn't your average David Letterman top ten list; it is an excellent guide to the direction of research in the earth sciences today, and bears repeating below. I have been struck in recent years how new research is deconstructing some fondly cherished ideas about the planet...hot spots that aren't necessarily deep mantle plumes, a possible new layer in the core (the inner-inner core? ), an older-younger-older and maybe younger Grand Canyon, a Sierra Nevada that is sinking, no rising, well maybe both, and a side of Mercury no one has seen before. The results of research are fascinating to see. One of the most important points I try to build into the minds of my students is the sheer excitement of living in a time when so much is being discovered. The list of the top ten questions bears repeating...here they are! A news release, a brief, and a full report (for a price) can be accessed at http://www.nationalacademies.org/morenews/20080312.html. Do you agree with the list? Would you have asked something different? How did Earth and other planets form? While scientists generally agree that this solar system's sun and planets came from the same nebular cloud, they do not know enough about how Earth obtained its chemical composition to understand its evolution or why the other planets are different from one other. Although credible models of planet formation now exist, further measurements of solar system bodies and extrasolar objects could offer insight to the origin of Earth and the solar system. What happened during Earth's "dark age" (the first 500 million years)? Scientists believe that another planet collided with Earth during the latter stages of its formation, creating debris that became the moon and causing Earth to melt down to its core. This period is critical to understanding planetary evolution, especially how the Earth developed its atmosphere and oceans, but scientists have little information because few rocks from this age are preserved. How did life begin? The origin of life is one of the most intriguing, difficult, and enduring questions in science. 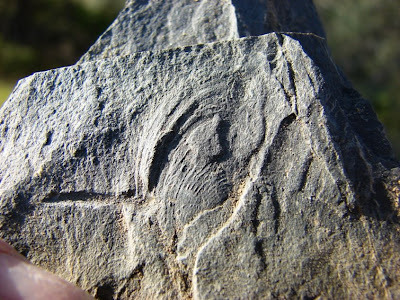 The only remaining evidence of where, when, and in what form life first appeared springs from geological investigations of rocks and minerals. To help answer the question, scientists are also turning toward Mars, where the sedimentary record of early planetary history predates the oldest Earth rocks, and other star systems with planets. How does Earth's interior work, and how does it affect the surface? Scientists know that the mantle and core are in constant convective motion. Core convection produces Earth's magnetic field, which may influence surface conditions, and mantle convection causes volcanism, seafloor generation, and mountain building. However, scientists can neither precisely describe these motions, nor calculate how they were different in the past, hindering scientific understanding of the past and prediction of Earth's future surface environment. Why does Earth have plate tectonics and continents? Although plate tectonic theory is well established, scientists wonder why Earth has plate tectonics and how closely it is related to other aspects of Earth, such as the abundance of water and the existence of the continents, oceans, and life. Moreover, scientists still do not know when continents first formed, how they remained preserved for billions of years, or how they are likely to evolve in the future. These are especially important questions as weathering of the continental crust plays a role in regulating Earth's climate. How are Earth processes controlled by material properties? Scientists now recognize that macroscale behaviors, such as plate tectonics and mantle convection, arise from the microscale properties of Earth materials, including the smallest details of their atomic structures. Understanding materials at this microscale is essential to comprehending Earth's history and making reasonable predictions about how planetary processes may change in the future. What causes climate to change -- and how much can it change? Earth's surface temperature has remained within a relatively narrow range for most of the last 4 billion years, but how does it stay well-regulated in the long run, even though it can change so abruptly? Study of Earth's climate extremes through history -- when climate was extremely cold or hot or changed quickly -- may lead to improved climate models that could enable scientists to predict the magnitude and consequences of climate change. How has life shaped Earth -- and how has Earth shaped life? The exact ways in which geology and biology influence each other are still elusive. Scientists are interested in life's role in oxygenating the atmosphere and reshaping the surface through weathering and erosion. They also seek to understand how geological events caused mass extinctions and influenced the course of evolution. Can earthquakes, volcanic eruptions, and their consequences be predicted? Progress has been made in estimating the probability of future earthquakes, but scientists may never be able to predict the exact time and place an earthquake will strike. Nevertheless, they continue to decipher how fault ruptures start and stop and how much shaking can be expected near large earthquakes. For volcanic eruptions, geologists are moving toward predictive capabilities, but face the challenge of developing a clear picture of the movement of magma, from its sources in the upper mantle, through Earth's crust, to the surface where it erupts. How do fluid flow and transport affect the human environment? Good management of natural resources and the environment requires knowledge of the behavior of fluids, both below ground and at the surface, and scientists ultimately want to produce mathematical models that can predict the performance of these natural systems. Yet, it remains difficult to determine how subsurface fluids are distributed in heterogeneous rock and soil formations, how fast they flow, how effectively they transport dissolved and suspended materials, and how they are affected by chemical and thermal exchange with the host formations. Back to geological beauty from above. 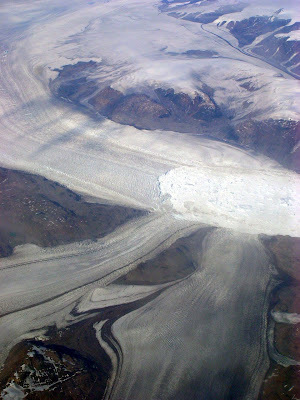 My flight in 2005 over Greenland was a stunner; glaciers are beautiful examples of erosion in action, and Greenland is a giant open-air observatory for studying and quantifying climate change. Greenland is one of those places I truly hope to one day see from ground level. It is very high on my geologist's life list. The sights from a plane are incredible, but there is still an isolation factor. A plane window is kind of like a television...you have little control over the content. You can change the channel (look out the other side of the plane), but there is no feeling for the air temperature, the odors, the sounds, and it passes by too quickly. 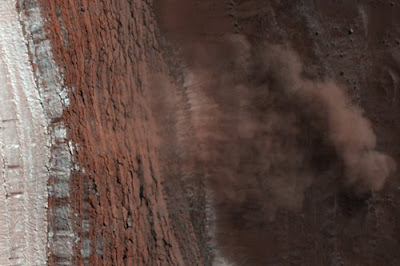 Silver Fox and Ron are both right, the weekend's photo was of air fall volcanic deposits that mimic sedimentary layers. 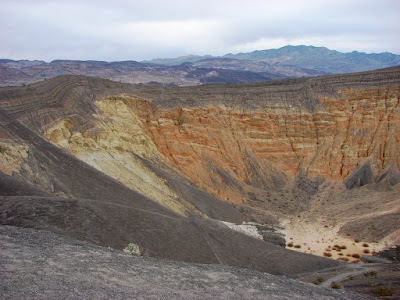 The locality is the Ubehebe Craters at the north end of the paved road in Death Valley National Park. The craters are a dozen or so maars, or phreatic explosion pits that originated within the last few thousand years (some researchers have suggested the last few hundred years). Basaltic magma, rising along fault zones at the north end of Cottonwood Mountains encountered groundwater (phreatic water) in the older clay-rich lake sediments, causing the water to flash to steam. The dozens of explosions were accompanied by ground surges of debris that formed the distinctive layers. Since years or decades or centuries separated individual eruptions, the layers were gullied by erosion, and subsequent eruptions coated the older rocks, causing an apparent angular unconformity (which I found to be the most interesting aspect of the photo). The sloping layers actually represent overlapping cones. I try to get my students to map the order of the craters that are visible from a walk along the rim. It is bigger than it seems...there are people standing on the bottom of the crater in the photo above. 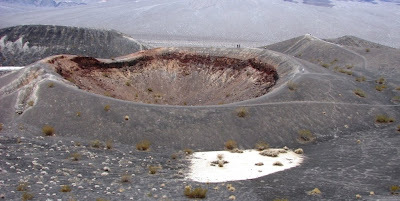 The biggest crater is 700 feet deep and nearly half a mile across. The photo above shows one of the smaller craters with the dark rim of debris layers and a small bit of gullying on the left side. People on the rim serve as scale. It's a great place to visit, but watch out for the persistent winds! Another interesting outcrop from the Death Valley region. 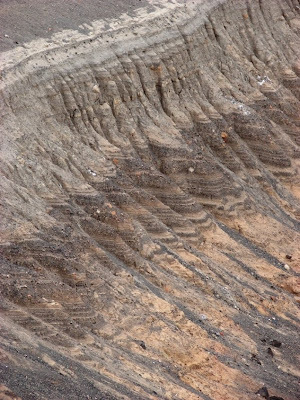 Ideas on the formation of the unusual pattern of deposition or emplacement? It is in one of the more remote parts of the park for those whose idea of "remote" means the end of the pavement without a return loop drive. The best clue I can think of is: is this outcrop igneous or sedimentary? Below is another view of related outcrops nearby. Y'all have a restful weekend. I am taking our Geology Club on a caving expeditition in the Sierra Nevada foothills tomorrow. 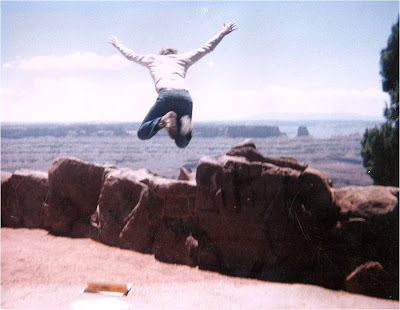 Soon after posting a few death-defying pictures, Julian at Harmonic Tremors posted an additional photo of an "Unsafe Rock Area" (Danger danger danger! 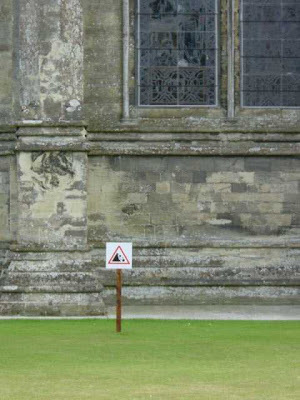 ), which brought to mind two of my favorite geology-related caution signs...the picture above is a sign warning of falling rocks at the base of a 400 foot "cliff" in southern England called Salisbury Cathedral! Apologies to Ron and Silver Fox for the delay revisiting last weekend's outcrop; all that death defying stuff distracted me. This is a well-known stop for many Death Valley field trippers at the south end of the Resting Springs Mountains just west of Shoshone. It is a marvelous site for teaching about faulting and aspects of volcanism. 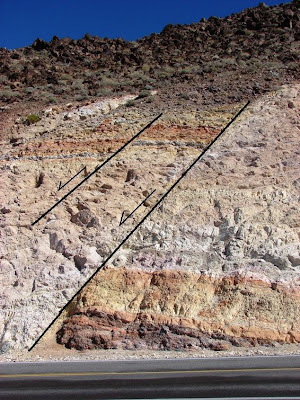 The prominent fault appears at first glance to be a classic reverse fault because of a tendency in one's mind to link the orange layers. The layer in the footwall (right) includes a dark lavender layer that is not present in the headwall, and thus the layers do not correlate. The smaller fault shows the correct offset. The rocks in the outcrop are primarily air fall tuffs, although a megabreccia is exposed nearby. The rocks have clearly been tilted a bit. 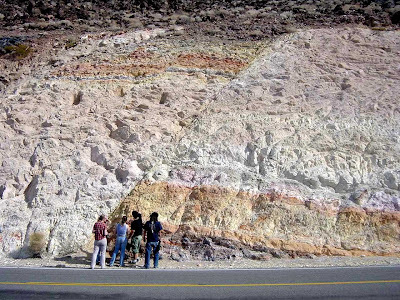 Once my students finish looking at and sketching the faults, their attention is drawn to the dark layer to the left. 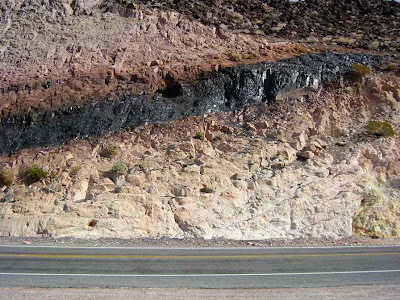 It is a vitrophyre, a rhyolite ash flow that was so hot when it was erupted that it remelted to obsidian in the middle. A close inspection of the outcrop shows pumice pyroclasts that are progressively flattened towards the dark obsidian in the center of the flow. The upper part of the flow shows vesicularity as gases moved upwards during the cooling phase. Apparently the flow is in the original orientation; it was not tilted, but was instead plastered against a sloping hillside. 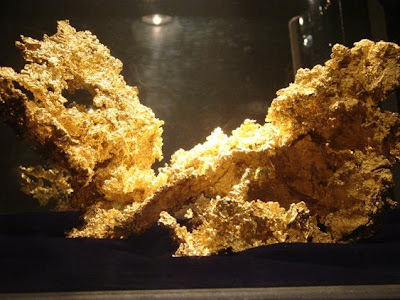 The vugs contain interesting minerals, including zeolites and other silicates. I wasn't so smart with this outcrop the first time I saw it. My instructor convinced us first that it was a reverse fault next to a coal seam, and then pointed out the inconsistency of the fault interpretation. Then it was hmmm? maybe not a coal seam, could it be a lava flow? Was it a dike? Oh dear, maybe we would have to figure out this whole thing ourselves. Researchers much more talented then myself have published a tract about the outcrop that has been reprinted and is on sale at the Shoshone museum, which is also worth a stop if you are in the region. They have an excellent exhibit on the mammoths and other creatures that have been excavated in the region. Check it out! Troxel, B.W., and Heydari, E., 1982, Basin and Range geology in a roadcut, in Cooper, John D., Troxel, Bennie W., and Wright, Lauren A., Editors, Geology of selected areas in the San Bernardino Mountains, Western Mojave Desert, and southern Great Basin, California: Volume and guidebook for field trip no. 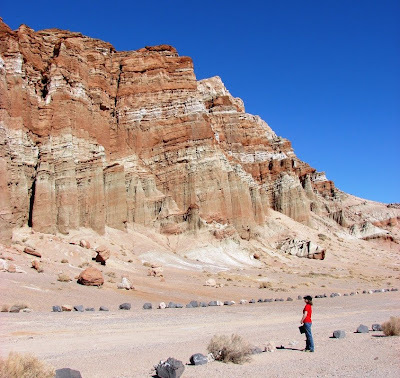 9, 78th Anniversary Meeting of Cordilleran Section, Geological Society of America: Shoshone CA 92384, Death Valley Publishing Company, p. 91-96, 202 p.
Julian's story reminds me of the nearest geology-related brush-with-death events that I can recall. The summer of 1994 was one of my greatest years, and yet one in which disaster followed me everywhere. Almost lost my wife, almost lost a student, almost stepped on three rattlesnakes simultaneously (WHAT were they up to?). The same day I lost the student and stepped on the snake, we were driving north on Utah State Highway 191 near the town of Blanding at approximately 55 mph, when our Ford Astro Van made contact with a deer that jumped over the crash barrier without warning. Neither the deer nor the van could be regarded the winner of the encounter. The driver of the van kept us in a straight line (avoiding a head-on collision with opposing traffic), but the radiator, air conditioner, water pump and various sundry engine parts were destroyed. To their credit, the mechanics in Blanding got the van running again for only $1,300 (which by amazing coincidence was how much in cash and travelers checks I was carrying at the time!). We got the van back, drove out to meet the rest of the crew, and promptly ran over a rock, busting the exhaust manifold. We sounded like a dragster the entire 1,500 mile trip home. And the transportation office at school was not too happy with us. And a late update...check out one of our newest geobloggers at Death defying geologists. As Geology Happens! says, he's new at blogging, unlike, say, me who has been haunting the geoblogosphere now for an entire two months. 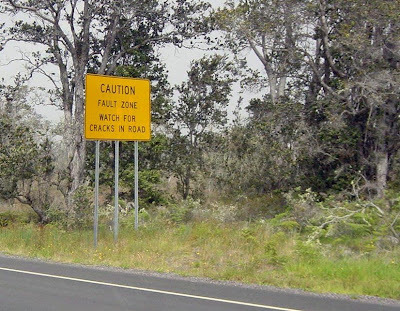 Watch out for falling rocks! And speaking of being in the right place at the right time...the pictures coming back from the HiRESE Orbiter over Mars are just spectacular. Read the story of this photo at http://hirise.lpl.arizona.edu/PSP_007338_2640, and more than 2,500 other images were released today at http://hirise.lpl.arizona.edu/pds_release_mar_08.php. 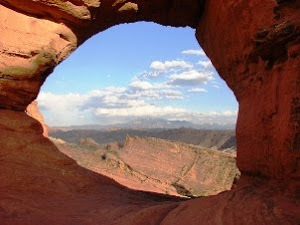 Thanks to Arizona Geology (http://arizonageology.blogspot.com/) for the links. I am once again reminded of how lucky I am to be alive these days, and how little we knew of the Solar System in the days of my youth. I waited for months for the chance of getting a telescope for Christmas when I was 11 or 12 years old. It was a bit like Ralphy hoping for the BB gun in Christmas Story. As luck would have it, the arrival of my beloved telescope coincided with the flooding in southern California in 1969, and it was actually weeks before I was able to actually look at stellar objects with my new pride and joy. And truth be told, I was a little disappointed, since stars looked just the same in the telescope as they did with the naked eye. I could see moons around Jupiter, and Saturn's rings, but not much else (and I certainly didn't take these pictures, however fuzzy). I was consumed with curiousity about the other planets in our neighborhood, and all the science books could offer were small fuzzy pictures of Mercury, Mars, Jupiter, Saturn, and Venus. Uranus, Neptune, and Pluto (the dwarf formerly known as the 9th planet) appeared as only dots of light. With the arrival of the first pictures from Voyager and all the other planetary explorers, our world was changed, and we are richer for it. Everyday, the people who do science, and their technological advances provide us with beauty and fascination, as exemplified by the continuing saga of the Mars Rovers and the Orbiters. Thanks to those who persevere in the face of budget cuts, and keep up the great work! Something about having a huge pile of laboratory notebooks to grade on a tight deadline brings out the sloth in me, and suddenly every little distraction takes on monumental proportions, and I just have to share. 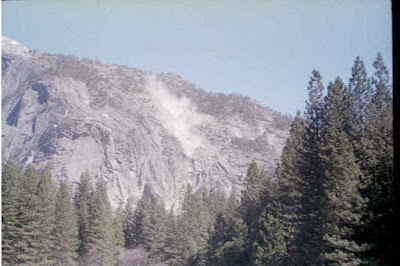 I just looked at, courtesy of Geology.com (http://geology.com/articles/yosemite-rockfall.shtml), a spectacular series of photos of a 2006 rockslide at Elephant Rock above the Merced River on Highway 140 just west of Yosemite, taken by Herb Dunn (http://herbdunn.com/). I am trying to imagine the excitement of witnessing significant geological events in action, and Herb had a seat right behind the plate so to speak. Check out the photos, they are spectacular. The photo above, taken by yours truly, is decidedly not spectacular, but it represents the only time I have seen a rock fall in Yosemite, despite something like 50 or 60 visits over the last 20 years. It happened on April Fool's Day in 2000, and I only had a cheap film camera at the time (my digital age began in 2001). And what did I do? Immediately drove as close to the impact site as I could so I could check out any damage. Seeing Herb's viewpoint (he actually didn't have much choice, with steep slopes and boulders all around), I considered what happens when events like this happen to geologists. We run for a better look! A landslide, a volcanic eruption, an earthquake, it seems like we can't resist; while others run away in a wild panic, I imagine many or most of us will be scrabbling for a camera and running towards whatever is going on. Today is the broader look at the outcrop in yesterday's post. It doesn't stop with the faults! What the heck is going on with the left side? Please feel free to guess in the comments section, but I'm not trying to make things mysterious or difficult; if you e-mail me I will explain it all to you. I am just wanting to show some examples of the really great teaching moments and places to be had in a treasure like the eastern California desert. If you are curious, this particular roadcut is about 4 miles east of the town of Shoshone on Highway 178 (the Charles E. Brown Highway, hence the Charlie Brown Outcrop). 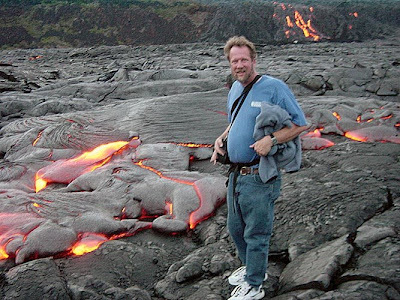 Joel Hagen is a fellow community college teacher at my school (computer graphics) who has attended enough of my field trips to qualify as a field geologist (he does, in fact work with NASA, the Mars rovers, and geochemical analysis). 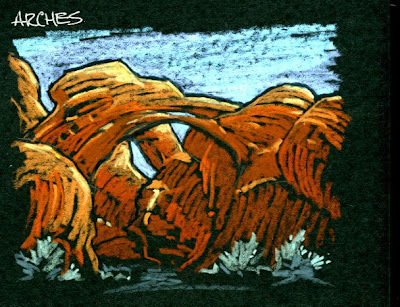 I invite you to see his incredible field notes, in the form of drawings and sketches that he has done in the Colorado Plateau and other venues...see them at http://virtual.mjc.edu/jhagen/geo-plateau/. Death Valley and environs is an unendingly fascinating collection of naked rock exposures. The next post or two concentrates on a particularly instructive roadside classroom east of the park near the Nevada border. It is rather famous amongst Death Valley travelers, and has been featured in a few textbooks as well. With a caption that as often as not is incorrect! Clearly a fault exposure....what kind of fault is it? It is a problem my first year students get to deal with on the second day of their field trip to Death Valley. 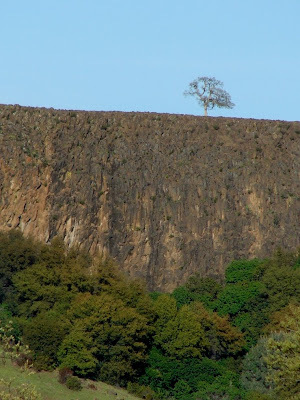 If you know this outcrop well, hold back a few hours and let others give it a shot.